One of our most popular models due to its size and huge double hinged doors that provide easy access. 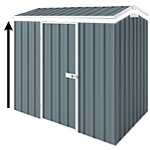 The zinc YardSaver G88 garden shed is one of the largest garden sheds in our range and definitely can help those out with BIG storage needs. This large storage unit can certainly find a place for everything inside. Ideal to park your ride-on mower in it and store your gardening gear, power tools, sporting gear, camping gear, folding chairs, pool toys, cleaning gears and the kids bikes.